The best showing yet for a wine from this under-rated vintage, the dark garnet-colored 1988 Latour reveals slight amber at the edge. A bouquet of melted tar, plums, black currants, cedar, and underbrush is followed by a sweet entry, with medium to full body, excellent ripeness, and mature tannin. The Latour vineyard covers around 78 hectares of the Pauillac appellation, of which 47 hectares surround the chateau, these being referred to as L’Enclos. This, the source of the grand vin, extends from the commune boundary with St Julien, where the vines meet those of Château Léoville Las-Cases (shown running up the slope opposite in the image below), from which it is separated by the Ruisseau de Juillac, which drains into the Gironde, up to the road to Haut-Bages-Libéral. 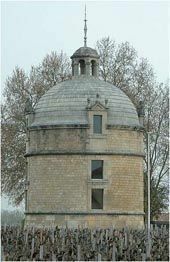 Other plots, acquired during the 19th Century under the aegis of the Ségur family, include Comtesse de Lalande and Petit-Batailley, although these are not generally utilised for the grand vin. The soil underfoot is Gunzian gravel, a surface layer just 60 - 100cm deep, originally carried down from the Pyrenees and the Massif Central by the Gironde when the glaciers melted in the early Quaternary period. Beneath that is a subsoil of clay and marl which has a depth of up to 5m, whilst deeper still is the limestone bedrock of Bordeaux. Cabernet Sauvignon accounts for 80% of the vines, the remainder Merlot (18%), planted wherever clay is more prominent, and then Cabernet Franc and Petit Verdot. After harvest there is a rigorous selection in the new chai, before the grapes are destemmed prior to fermentation, with separate tanks for the numerous aliquots of wine, divided up according to plot of origin, age of vine and naturally grape variety. Then a three week cuvaison followed by malolactic in vats, prior to selection of the vats for the grand vin. This is Chateau Latour, which is typically 75% Cabernet Sauvignon, 20% Merlot, the balance Petit Verdot and Cabernet Franc, although naturally this can vary greatly depending on the vintage. There are perhaps 18 000 cases of the grand vin produced each year (again very variable). The Second wine is Les Forts de Latour, introduced in 1966, and typically 70% Cabernet Sauvignon, 30% Merlot, of which there are perhaps 11 000 cases produced each year.